Make sure your tires are properly inflated to the suggested PSI. Not only will this improve your gas mileage, but it will also make your tires last longer. We suggest checking your tire pressure at least once a month and whenever the temperatures outdoors dip quickly. Having tires that are properly aligned can also indirectly improve your gas mileage. Tires that are misaligned will wear unevenly, which can cause strain on your engine and thus reduce your fuel efficiency. Another reason to have a smooth ride with Sugar Land’s go to tire alignment shop. Always tighten your gas cap after filling up. If your gas cap is damaged, loose, or missing, replace it. A loose gas cap will allow gas to vaporize out of your tank. Use cruise control to maintain an even speed and maximize your gas mileage. Observing posted speed limits will keep you safe and help your fuel efficiency as well. Purchase gas during the coolest part of the day when gasoline is densest. 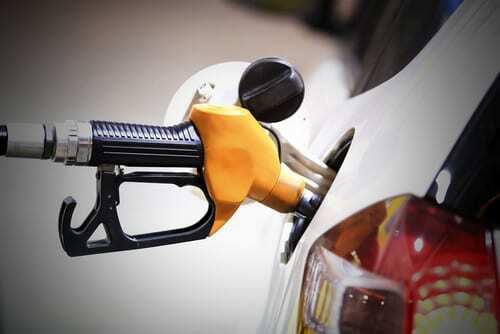 Pumping slowly will also allow you to fill your tank with more gasoline and less gas vapor. This will ensure you get the most gas for the cost and more miles out of your tank. Plan your errands and routes to be as efficient as possible in order to reduce the amount of gas you use. Remove excess weight from your vehicle. A heavier load means you’ll get fewer miles per gallon. You can reduce weight, and cut down drag as well, if you remove your luggage racks, sport racks, and cargo boxes from your vehicle when they’re not in use. Use your phone. You can download many free apps to help you find the cheapest gas in your area. Whether you’re at work, home or just on the go you can use traffic and gas apps to help you find the best route and best gas prices for optimal MPG. As always, never use your phone while driving. Similarly, if the weather is hot – and Texas summers always are – park your car in the shade and use a sun screen in your windshield to lower the temperature of your car’s interior. If you don’t have to run your air conditioning as hard to cool your vehicle, you’ll be another step closer to getting better gas mileage. Above all, make sure that your car is properly maintained. Stay on top of your oil changes and address any major maintenance issues as soon as possible. Vehicles that run properly and efficiently will also efficiently use gas. Providing maintenance and more, our Sugar Land auto repair shop, Colony One Auto, can help you maximize your gas mileage with a few simple tips and services. Contact us for all your automotive needs.